As a school counselor, have you thought about approaching controversial topics with your students? Are you nervous? Do you wonder how to address the naysayers? 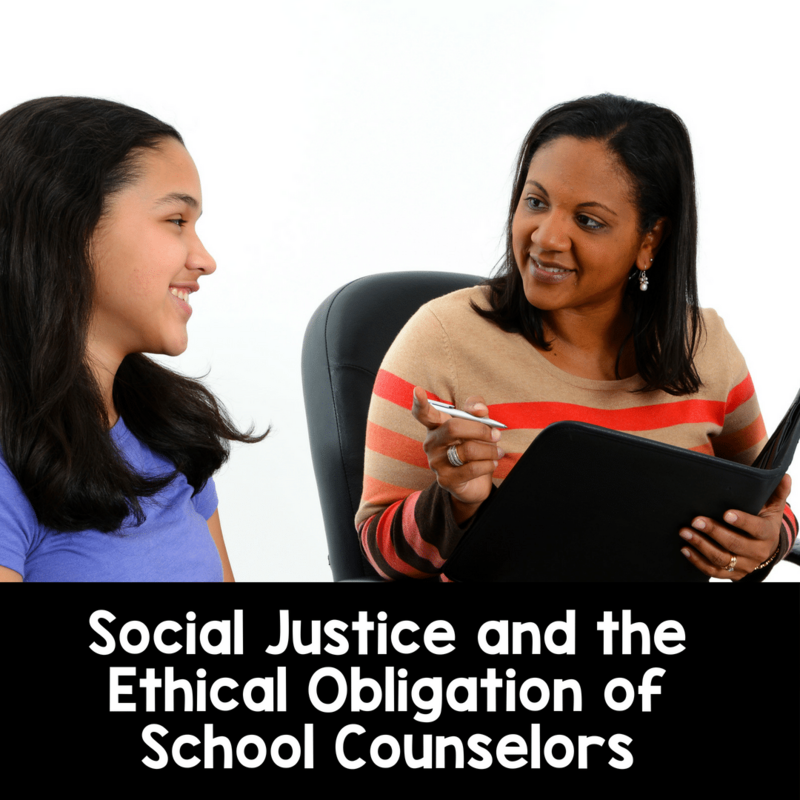 In light of recent events, I have talked to some school counselors who feel nervous or scared to infuse social justice topics throughout their counseling programs. For example, a counselor may know, for example, that their transgender students are enduring bullying but hesitate to propose programs to support marginalized youth populations when they know superiors, even sometimes other counselors, will not approve. Other times, individual counselors may feel isolated if they are the only one on their team willing to approach something like how racism negatively impacts students’ mental health and academic performance. Some understandably fear retaliation by their administration for being “political” or worry about pushback from white parents. However, what is great about being a school counselor, though, is that our national professional association completely takes care of us in this area. The American School Counselor Association is the best friend a school counselor can have. ASCA’s Ethical Standards document offers us support and guidance when we need it most and also pushes us to perform at our absolute best to achieve our highest aspiration-helping all kids reach their dreams. Even though it is such a valuable companion, though, sometimes we forget to consult it on a regular basis. It’s important for all school counselors to familiarize themselves with ASCA’s Ethical Standards and their most recent position statements on wildly relevant current events and important topics affecting kids and families. Both offer exactly the answers we need to inform our practice and to justify our inclusion of social justice throughout our program to anyone who questions it. The ethical standards simply express what we are expected to do, and they make it very clear that, as culturally responsive counselors, we do not impose our beliefs or values on students but instead provide effective counseling services by committing ourselves to continual research to best understand and appreciate students’ diverse gifts resulting from their multicultural backgrounds. We are to be advocates for diversity, equity and systemic change for the benefit of all students. Political party affiliation is not a factor where our ethical standards are concerned: school counselors are expected to serve and affirm all students with our programs and speak up when marginalized students are being harmed and denied access to an equitable education-because it is the right thing to do for kids. A heartbreaking example of children being harmed dominating the news cycle lately is the cruel practice of separating undocumented families at the border. As counselors, we know very well the numerous, traumatic effects that will result from removing children from their caregivers, particularly at a young age, as well as how developmentally detrimental being detained in a detention facility even with family members will be. As the policies are changing constantly, we may not know exactly what will happen next to these families, but we can count on these impacting children in our schools. As school counselors adhering to our ethical standards, it is absolutely our duty to serve as advocates in this situation. If any principal or administrator has questions or concerns about us addressing immigration in school, we can respectfully refer them to ASCA’s ethical mandate to us that we learn how immigration status affects students and intervene with counseling strategies to alleviate those unique stressors. Offer individual counseling services to students experiencing trauma or stress related to undocumented status. Referrals may come from teachers with knowledge of students’ home life and circumstances, parents or from students themselves. Make it clear to students during individual counseling sessions that it is safe to talk to us about their fears related to immigration and documentation concerns by reassuring them about confidentiality. We need to tell students explicitly that we will not alert any authorities regarding their citizenship status or the status of their family members. Having a school counselor to talk to about feelings they may not share with anyone else will at the very least help students feel connected and supported and hopefully increase their sense of school belonging. Research outside community counseling agencies and organizations fully for when you need to refer a student for more intensive counseling services. Find out who is bilingual, who accepts a wide variety of payment plans, and who specializes in working with youth experiencing issues related to undocumented status. This way, if you need to encourage families to seek outside therapy, you can provide them with the most culturally responsive options. Stay abreast of all post-secondary opportunities for undocumented students, and provide individual academic advising sessions for them. Post-secondary opportunities vary for undocumented students, and it can be very difficult to navigate. Some students might give up as a result of the complexity. As school counselors, we can reach out to colleges and universities to figure out everything our undocumented students need to know in order to ease the difficulty and help them achieve their goals. Many post-secondary opportunities are made available through DACA, so inform yourself on the program and help students maintain their eligibility if possible depending on changes to the program. Create a welcoming school environment for all families in your school. Ensure access to school information in every language spoken by your school community. Invite family members to learn more about your school and how they can get involved. Just as you informed students, tell families explicitly that you will do everything you can to make school a safe environment for them and their children. If families disclose that they are in crisis or struggling with issues related to being undocumented, link them to resources in the area and provide an emergency plan if necessary. Inform yourself on immigration policy and issues impacting undocumented youth. Then lead (or co-lead) professional development sessions for teachers to increase their cultural competence so that your school climate is one that embraces inclusivity and diversity. Interrupt any discriminatory or racist comments staff members may make, and educate them on why that harms children. Encourage administration to hire bilingual staff who can communicate in the native languages of families in your school’s community. Advocate outside of the school building as well as within it. In addition to speaking up in all the aforementioned ways in your school, contact your local and state officials to voice your support for policies and laws that will result in an equitable learning environment for students and those that will help remove barriers to healthy child development. School board meetings can be boring, and sometimes people forget about them and do not attend. To adhere to our ethical standards, we must let our local leaders know the importance of creating welcoming schools for undocumented students and families. If there are policies in place district-wide that are hurting this vulnerable population of students, it is our job to show up and let our district leaders hear our expertise in school safety and student mental health and well-being. Advocacy is one of my favorite parts of being a school counselor because it gives me a chance to make a detectable impact on my students’ lives. It is by no means easy, but practice helps a lot. If you ever get nervous or unsure, though, remember ASCA’s on our side. Consult the ethical standards, consult the position statements, and encourage anyone who questions your social justice advocacy to do the same. It will be very clear to everyone that advocating for equity for students is not optional for ethical school counselors.